AMES, Iowa — New technology from drones to tractor rollover detection are aimed at keeping farmers out of dangerous situations. Drones, modified from their current military use, could be flying soon over Iowa corn fields, allowing farmers to check on growth from comfort and safety. Devices installed in tractors could warn farmers when they are in danger of overturning and send alerts to loved ones and rescuers when accidents happen. These new technologies could help protect farmers, who work in the most deadly occupation in Iowa. 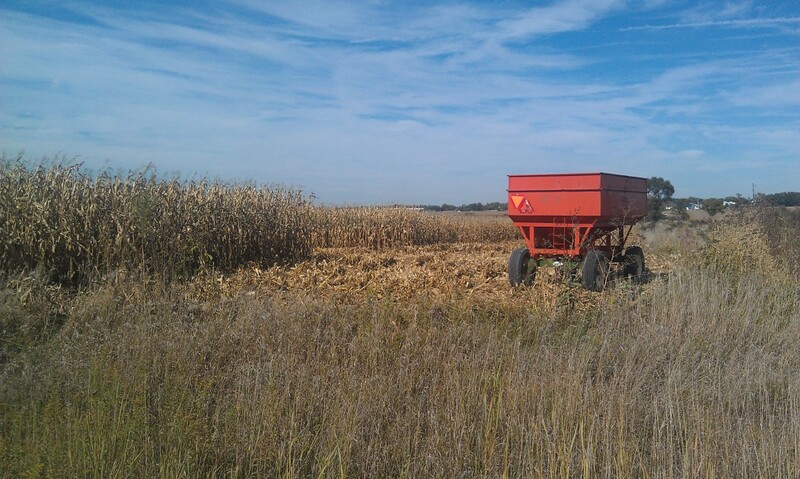 Farm fatalities represent more than 30 percent of all occupational fatalities in the state, according to data from the Iowa Fatality Assessment and Control Evaluation program. Between 2001 and 2011, tractor rollovers made up 35 of the 280 farm fatalities. Grain bin accidents accounted for an additional 35 deaths. “It’s devastating and it’s sad. And it can be prevented,” said Chris Petersen, an Iowa farmer from Clear Lake who serves on boards of multiple farming organizations. Engineering and industrial design students at Iowa State University are trying to tackle the challenge of tractor rollovers. Mitchell Hinrichsen and John Pritchard, students at Iowa State University, pose with a prototype of their tractor rollover device. 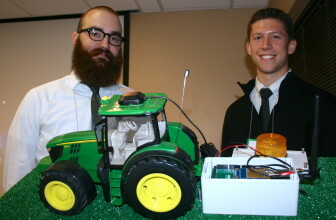 The group created a small device that could be added to tractors to warn farmers when the vehicle begins to tip. It also would send an alert message to family and emergency response departments when a rollover happens. That alert can reach up to 40 miles from the scene of the accident. John Pritchard and Mitchell Hinrichsen presented a prototype of the device, which they called ET, during the 12th Annual Midwest Rural Agricultural Safety and Health Conference in Ames, Iowa. 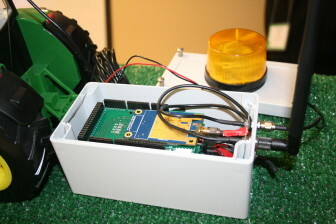 A small John Deere tractor was hooked up to an orange warning light and a brick-sized box containing circuit boards and an antenna. Rollover protection structures, ROPS, are required on all tractors built after 1985. Studies have shown the structures to be nearly 99 percent effective, when used with a seatbelt. They can be added to older tractors but many farmers continue without them because the farmers don’t like the look or because the added height wouldn’t allow farmers to store the tractor the same way. The alert could reduce drastically response times. It sometimes can take hours before the family or friends notice a farmer’s absence and are able to locate a farmer who has been in an accident, meaning emergency responders sometimes don’t get to the injured person until long after the accident happens. “We really need to create a safety device people are going to want,” Hinrichsen, a masters industrial design student at ISU, said. That means being less intrusive and less noticeable. “They don’t want the big ROPS. They don’t want to take away from their baby, their favorite tractor,” Hinrichsen said. ET, a prototype of a tractor rollover alert device created by graduate students at Iowa State University. Other devices already on the market include sensors that can be placed in grain bins and out in fields to keep farmers out of dangerous situations, Gunderson said. Grain storage bins can be hazardous when farmers climb in to check the quality of the grains and become stuck or buried. “Agricultural producers are interested in keeping all of these products in prime condition so that they are ready either for sale or for use in livestock operations. So they are monitoring these products within these storage structures,” Gunderson said. Drone technology, for example, can help farmers who work in the fields but also come into contact with pesticides and other chemicals, Gunderson said. Drones can allow them to assess crops without stepping foot into fields, using video equipment that can cover 150 acres in 15 to 22 minutes, he said. But farmers don’t have to venture into cutting-edge technology to start improving safety, speakers at the Ames conference said. Some common place devices are valuable. 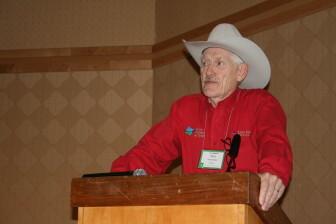 Gunderson held up his cell phone to an audience at the conference. “If we could ensure that each producer uses one of these and has one strapped to their side every time they leave the cab, that is one of the greatest things we could do for farm health and safety. Why? Because this thing is geotagging virtually all the time. It knows where you are,” he said. As a result, rescuers can use the cell phone to locate farmers who get hurt in the fields but cannot call someone for help. Because farms often cover hundreds of acres and frequently have a collection of outbuildings, these rescuers can have a difficult time not only locating the farmer, but avoiding hazards themselves. “One of the challenges you face as a firefighter, is you arrive at an emergency at a farm and have no idea where things are, where the gas lines are, where the manure pond is. In Wisconsin snow on manure ponds look a lot like a road, and a fire truck on a frozen manure pond doesn’t last very long, Matt Keifer, of the National Farm Medicine Center, said. Keifer presented at the Ames conference a tool famers could use to map the locations of water sources, power and gas shutoffs, on-farm roads and other important features so emergency responders can find their way around. The Farm MAPPER Project, which has been tested out on a few farmers in Wisconsin, allows farmers to select from a set of icons to develop a map, then post this map in a place where emergency responders can access it. In a trial run, farmers used QR Codes — bar codes that can be scanned to pull up the map. The code was secured with a password to prevent others from accessing the information. Keifer said the team was working to develop the program further and spread it to farmers across the country. Like what you see? Please consider a tax deductible donation to support our nonprofit, investigative journalism in Iowa at this link. An edited version of this story was published in Iowa Farmer Today. Chris Petersen, of Clear Lake, Iowa, has farmed and raised hogs for years. As a board member of the Iowa Farmers’ Union and Iowa’s Center for Agricultural Safety and Health, I-CASH, he has worked to raise awareness of farm safety issues.